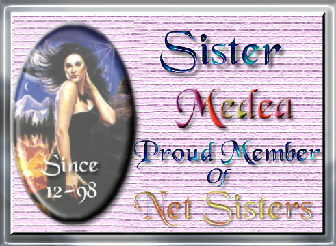 If you'd like to join my new Sisters In Need Web Ring your more than welcome to no matter what group of sisters you belong to. I'd love to here from you all. I can reached by ICQ or email. Follow this Link for my ICQ home page or use my #11259141 simply put net sisters in your request to get approved. In hopes of uniting women all over the world, we have developed a web ring that is all accepting and all encompassing. Women are becoming more aware of their own presence on-line and we wanted this webring to be an additional awareness for women everywhere. As Net Sisters, we will help each other, lend a listening ear, laugh out loud at all of the craziness in our lives, and just try to touch each other in our own special ways. With incredible talent and knowledge among us, Net Sisters will rise above the negative voices of the on-line world and become a force to be reckoned with. Join us today and meet some of the most incredible people on the planet and feel like you actually belong somewhere in cyberspace. 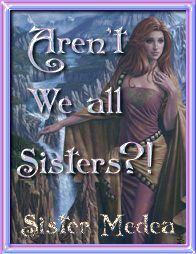 Afterall, aren't we all sisters? If you have any questions about anything then please email me. I am always here to help.